Completely enjoyed this book! I read it quickly in two days, which isn't usual for me. The story was fast-paced and very easy to read. I adored Adele's character. I found her easy to relate to, vulnerable but not taking any garbage, and funny to boot! Pete was the perfect stoic, handsome jerk. The much older man who never really let anyone in. The two met while Adele is visiting her dad for summers. Pete is a construction worker at Adele's dad's firm. He takes Adele under his wing while her workaholic father isn't very available. Adele is in love with Pete, but he sees her as nothing more than a kid. Seven years later, Adele comes back for her father's wedding and she's all grown up now. Pete is now a partner in the construction business with her father and owes a lot to the man, being attracted to his now grown daughter isn't something he thinks he should act upon. These two characters have history and lots of chemistry! I enjoyed Adele really giving it to Pete. She's a woman now and she can tell Pete can see that, whether he wants to acknowledge it or not. The two have fantastic banter that had me giggling often and smiling throughout. I also loved Adele's new stepmother playing matchmaker at every turn. Five star romantic fun! It Seemed Like a Good Idea at the Time was the perfect escape on a hot summer afternoon while trying my hardest to seek shade. I read the novel from cover to cover, ignoring my surroundings, while getting an injection of feel-good romance and heart-clenching angst. Told primarily in the present, with a few scenes littered throughout to show the past perspective, our narrator weaves a tale of teenage infatuation that never abated now that she's in her mid-twenties. 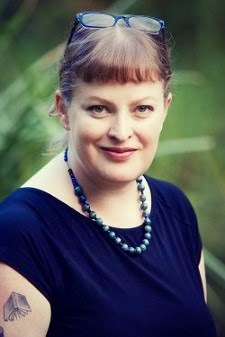 As the daughter of divorced parents, Adele lived with her mother but spent time with her workaholic father, spending a lot of time on work sites. This endeared me to Adele. As the daughter of a workaholic contractor myself, I spent a good deal of time sitting under trees with toys while watching the 'men' work, then as I got older, I was told to lend a helping hand. The new guy took a teenage Adele under his wing so the dad could concentrate on working, and this is female catnip everywhere. An attentive, manly man with big strong hands, acting as a gentle mentor and best friend to a girl, showing her how a grown man should and shouldn't treat ladies. I won't spoil what happened in the past to put a wedge between Pete and Adele, and caused her to come home to her dad's wedding with her tail tucked between her legs, but it was quintessentially teenage girl, for sure. Pete is now in his forties, Adele is a grown woman, and the maturity gap has shrunk considerably, if you factor in emotional maturity. The sparks fly, with a bit of love-hate tossed in for good measure. The novel was a perfect escape for me, filled with quirky characters, manly men, a gruff father, and the perfect stepmother any girl could dream to have. I highly recommend to Kylie Scott fans, warning this isn't as hard-hitting as other books she's written but just as fabulous nonetheless. Once you realise what the seemingly good idea was, you sort of have to laugh, and yet cringe, and also feel sorry for Adele. We travel backwards and forward in time repeatedly, which works at explaining the level of friendship between her and Pete. And to be honest, the complete misunderstanding that arose due to them seeing each other in completely different ways. We see that fairly quickly, but when it finally dawns on Adele it is almost heartbreaking. Brilliantly written – and I am guessing that for many of us, a reminder of a similar moment of revelation and distress. There are plenty of funny moments too, especially regarding Adele’s father and new wife, Shanti – she was a blast! There were some clever twists, which I did not see coming, and some lovely changes of pace and intensity, which gave life to an unexpected love story. 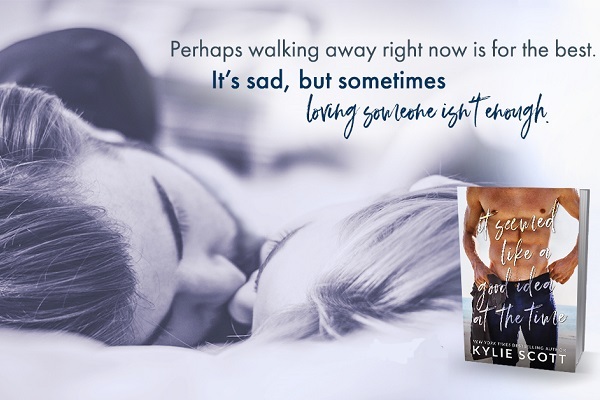 Reviewers on the Wicked Reads Review Team were provided a free copy of It Seemed Like a Good Idea at the Time by Kylie Scott to read and review for this tour. Two copies were provided by the author; additional copies were purchased by the blog.